Other people’s blogs hold answers too. Discussion with Jean McEwan, and Sharon Hall Shipp brought up the topic of archaeology. It struck a real chord with me, with the work I’m doing now, and what has gone before. I am digging into the past. Sometimes it is my own, sometimes not, but that doesn’t really matter. It all has resonance. I dig into my brain, my emotions, my memories. I ferret about for things in second hand and charity shops, waiting for that tingle in my fingers that tells me I’ve found something, unearthed it. Something that no one else has spotted. Then I do something to it, to highlight what I see. 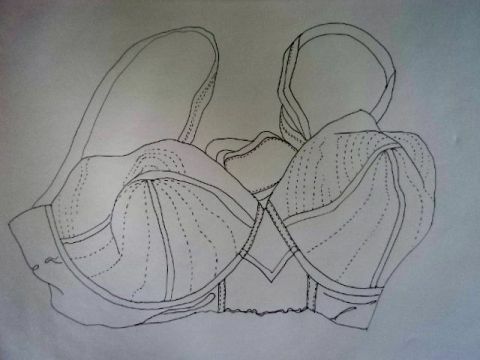 I had thought that these line drawings of bras were different, but they’re not really are they? These garments have been discarded for some reason. I rediscover them. I record their state in simple line drawings in black ink. I now have nine A3 drawings on layout paper. I wanted them to have a fragility. (Storing them is a bloody nightmare… I need a plan chest.) I wanted to be able to see one drawing though another. The more of them I do, the clearer it gets. I am piecing together a sort of conglomeration of a woman’s life. I don’t think it is mine, but you never know, it might turn out to be. What I feel though, is that these bras are too clean, too nice. I know that out there are bras that have been worn into the ground. Grey, frayed, the elastic no longer elastic. Desperate bras. The clothes on the top, for public viewing say what a woman wants to show the world, how she wants to be seen (presuming the clothes have been chosen by the wearer, there are circumstances where this may not be the case). The clothes underneath, unseen except by a partner, perhaps not by anyone, speak about how a woman feels about herself. The discarding of the bra is seen differently, depending on who you ask. It might indicate a passing of a stage, be that puberty, motherhood, maturity, menopause, illness, death. It can also be a sexual act. I have only asked women what they think of this series of drawings. What do men think? Tell me. So I keep drawing, keep collecting. The original bra that sparked it all off, has been embroidered, but I am thinking of unpicking it. It is a different story this one. My interference minimal – more observational, a scientific approach? Archaeological? The first thing was an overwhelming weakness in my legs, that almost made me sink to the slippery floor, exhaustion, and relief that the week was done. The second was an amazing flood of adrenalin that halted the descent, and helped me whizz over the remaining dusty floor… My time was my own again. The call of the charity shops, the desire to fondle second hand bras. I think those closest to me are quite concerned about this current obsession. Am I perving around the edges they wonder? Or is it deeper than that? Hmmm… Perving around the edges? Defo. 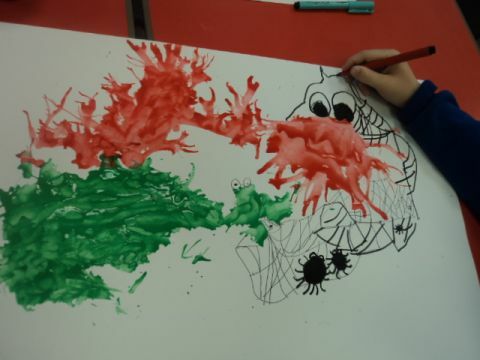 Next week is Arts Week in school. I will be there every day, from 8am to 5pm…ish… I’m usually there just 16hrs a week, over 3 days. I suppose it is the climax of my school year. The planning of it exhausts me (especially at the moment) but the doing of it exhilarates me. The sheer joy and adrenalin gets me through the week, then I flop. Incoherent. Incapable of doing anything that requires thought for days. If you had asked me on Friday afternoon if I was ready, I would have said yes. I’ve got all the visiting artists sorted, all the kits, all the activities for the children to do with me – this year, mostly clay based, as we don’t seem to get much 3D work, or such mucky work otherwise. And then I went to Ormskirk and saw the work of Paola McClure in the Chapel Gallery. I am totally enthralled with her textile sculptures. The figures are both funny and disturbing. I am now desperate to get these shapes into some sort of form, and as I have told everyone I’m doing clay, clay it will have to be. I will have to persuade/tell class teachers I don’t want to make Aztec masks or animals any more, but these curious alien/human forms. They remind me of Shonibare’s Dysfunctional Family too. Big heads and hands, thin necks and limbs. Goodness knows how I’m going to construct these… but we’ll have a go. I can see about 100 of these figures in my head now, child-made, brightly painted, weird and wonderful. 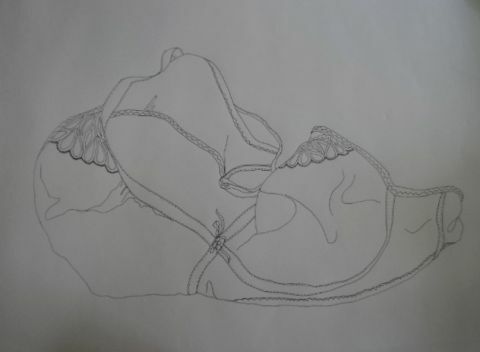 I now have six or seven bra drawings… haven’t counted properly. The more I do, the more I love them. There is something about a simple ink line drawing that appeals to me. There’s nowhere to hide is there? I have chucked out a couple of drawings because the line has strayed from its path, looks unclean. There is a fragile crispness about the ink on the white layout paper. The discarded pile of fabric, holds a certain distorted form, without the body inside it. I needed to gather comment, to tell me where this might lead me. Some saw the abandonment of this garment as a sexual act. Others saw it as symbolic of our mortality. A loss of sexuality and libido rather than an illustration of it. When I started this series of drawings I was shocked by how quickly my thoughts developed. I do life drawing, and I draw visual notes in my sketch books. The drawing is usually a way of annotating my work. It is a very long time since the drawing itself has been the art. But this series of observational line drawings are more than just the drawings. And despite the change in choice of material, there are clear links to what has gone before. I am still using clothes to say things about their wearers and to elicit thought from and about the viewer. The viewers’ memory is vital to my work I think. The change of materials has been coming for a while too, eventually emerging when I had no choice but to find another way of working. So now I am not automatically reaching for my needle, I am making choices from a wider field. Also, since the enforced period of not-sewing, my work has been produced much more quickly. To be honest, that was due too. I was getting stitched up in it all. The drawings seem fresh to me. 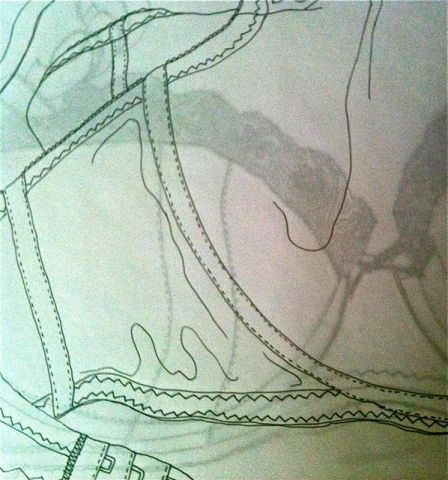 I am plucking up courage to draw my own underwear. Yet as I type this, a sneer of distaste passes across my face. Drawing other people’s anonymous bras seems sanitised. I haven’t yet decided if that is a good or a bad thing. Probably it is only by drawing my own I will find out. I was also offered an old bra by a friend… I said yes, but I’m not sure how I feel about that either till it happens. It might then become a type of portrait. Is anonymity safe, universal and symbolic? Once I start drawing underwear of the known wearer, does it change into something else for me? Obviously the eventual viewer will be unaware of personality and ownership. My thoughts had been about menopausal women, and self esteem. But just because that’s where I am, doesn’t mean that is where the viewer has to be does it? Suddenly, overwhelmingly, to the point of putting aside for now all other work, I am besotted with old bras. 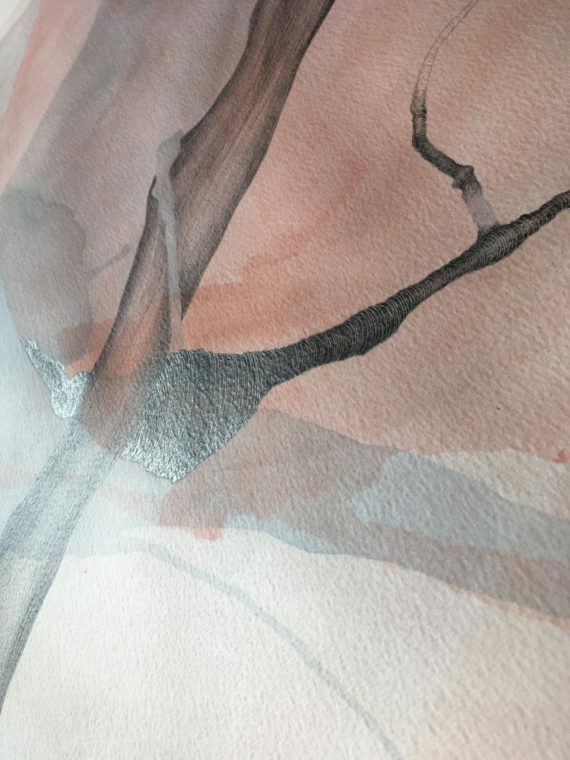 This has sort of come from nowhere… although I am sure once I get going, I will be able to think and more clearly map the thought process that got me here. I suppose it started with the bra I found in the Cambridge junk shop. There’s a photo on here somewhere. I might re-post it. It has been hung on the studio wall looking at me. I have done a little bit of embroidery on it, but I don’t think anywhere near enough. This garment needs to be obsessed over. I am sure it also has something to do with my age… 52… I toyed with coyness, but what’s the point in that? I am watching the women around me deal with this age, stage in their lives. I find it fascinating. There is a fine line between relaxing into who you are, and letting yourself go. Also a fine line between living life to the full and being desperate to prove yourself younger than you are. Internally, it basically comes down to personality which way you go, but others put the label on it… and there are so many variables. I leave other people to decide which way I am headed (I suspect towards the desperate frantic, “youth vampire” thing). I want to deal with then, the bra as a way of illustrating my point. I buy ever more expensive underwear for myself to make me feel better, even though few people see it, the hope is they might see the effect it has. In contrast, I am on the hunt for decrepit, derelict bras from jumble sales and charity shops (although what I really want are the charity shop rejects, the sort they could never put on the racks). I’m not even sure about the extent of the sexual aspect here. It appears at first to be more about self esteem, but you can’t strip out the sexual from an issue that involves a woman no longer being unable to bear children can you? And this is where the blogging might get tricky. I do not intend to map my menopausal journey for all to be horrified by… you will be relieved to read! But as I have written before, the highly personal work is the work that is human and universal. Art about life. Do let me know when it gets uncomfortable won’t you? Because those are the bits I like!